I’m just going to come right out and say it: this film had its moments! If you haven’t seen it yet I recommend you stop reading now because I’m going to be discussing it in detail and I’d hate to ruin the surprise for anyone. My outfit for this evening’s 3D screening. There. I’ve done all I can. If you still see spoilers it’s all on you. Big surprise: the first dinosaur that you see all of is completely feathered! That said, it’s an avian dinosaur: a full-fledged modern bird. The best thing about going into it with the lowest possible expectations was that I was half expecting them to try and explain no feathers by removing them from modern birds in the Jurassic Park universe, so I was overjoyed when they didn’t do that. In fact they even had a crack at explaining the absence of plumage: Dr. Wu defends his creation of the Indominus rex (the Tyrannosaur x Velociraptor x Cuttlefish x Amazonian frog hybrid) by telling Masrani, the new head of Ingen, that he’s done exactly what was asked of him. That he’s always made whatever the investors wanted and that none of the dinosaurs in the park are natural and would look very different if they were. Essentially this is explanation #4 in my pre-film grumble about accuracy. The park’s bean counters don’t want real, they want “bigger teeth”. This is a very handy way to explain away any and all inconsistencies that a person might find in the dinosaurs and paves the way for inaccuracy in any future films there may be. It does help with the suspension of disbelief but at the expense of the moral message of the film. Every story has at least one moral message. Some hide it better than others but they’re always there. The first Jurassic Park had a message of respect for nature and that man’s attempts to control it will ultimately fail because “life will find a way”. According to the exchange between Jurassic World director Colin Trevorrow and Gizmodo journalist Gerald Lynch, we are told that the intent of the movie is all about real dinosaurs being cooler than artificial ones. If that’s the direction I salute it because it hints at future films being more accurate than the current story trajectory (although the embryos are on the hands of the military now so I’m not holding my breath). The film itself does feature the real dinosaurs and mosasaurs working together to defeat the Indominus rex freak and shows the Tyrannosaurus reclaiming her throne with a hearty roar, seemingly supporting Trevorrow’s assertions about the film’s underlying message. Dr. Wu’s line that all the dinosaurs in the park aren’t natural undermines all that. At best we can say that the moral message of Jurassic World is that less artificial dinosaurs and mosasaurs are better than artificial ones if they behave in an artificial way and work together for a common purpose. That’s a pretty watered down message! In conclusion, the human performances were good and the dialogue was genuinely entertaining, the style of certain scenes drew enough on my emotional attachment to the first film to really move me. The grand delivery made me long to be there and wish even more that the dinosaurs looked better, it would’ve been an exceptional piece of movie magic if they had. Meanwhile, the concessions made to explain away the inadequate dinosaurs, pterosaurs and mosasaurs compromised the delivery of what could have been epic. 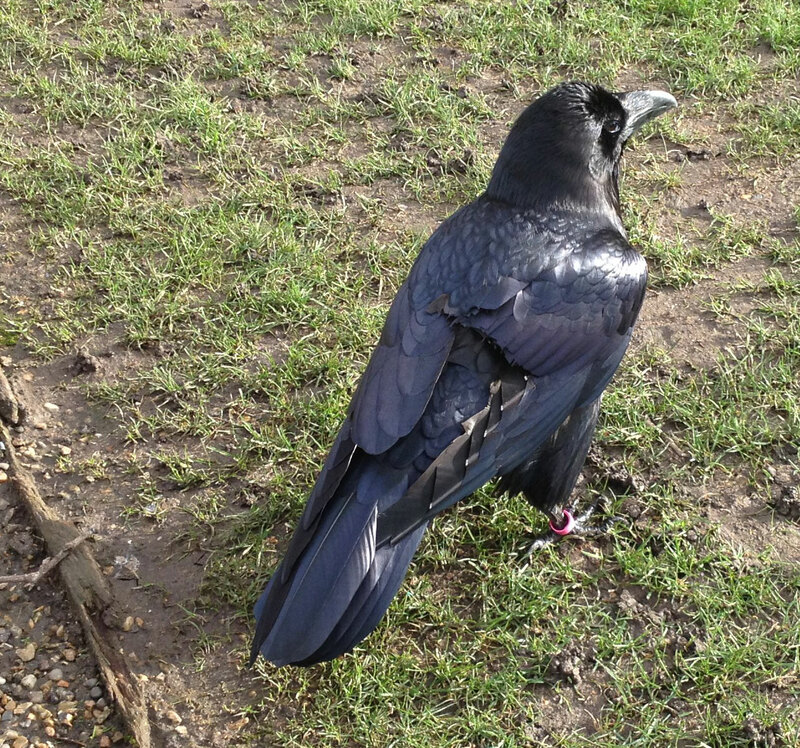 Mortimimus vulgaris, ambushes disguised as a carcass – based on observed raven behaviour. It’s 1993. 15-year-old me walks through a suburban Sainsbury’s supermarket, eyeing the lacklustre selection of paperbacks: A Jilly Cooper novel; a biography of Ian Botham; … Something with a dinosaur on the cover?! I pounce. It’s a novel about dinosaurs brought back to life and the opening chapter has an evisceration in it! This Michael Crichton fellow had taken my most frequent dreams and brought them to life on the page. My excitement continued to grow when I discovered that there was a film due out soon. I followed avidly as the rest of the world got caught up with me in “Dino Fever”, as Film 93 called it. I watched every documentary about the science of Jurassic Park, built dioramas of the dining area out of card and made illustrations of all the imagined views from the security cameras. In short, I immersed myself in Crichton and Spielberg’s world and did so for the first two and a half films. The dinosaurs were pretty great for their time. It was the first time that dinosaurs had been portrayed as warm-blooded like a bird or a mammal. This was a subject that had been published in popular science books as early as 1975 but the public’s perception hung on to the image of them being “too slow and stupid to survive”. Were the general public ready to have that perception shattered and replaced by a new one, full of agile, intelligent animals? Apparently so. The brand took off and it gained a huge following. Were there problems with the dinosaurs? There was the rather curious decision to portray Dilophosaurus as a small, venomous reptile with an expandable neck frill. The actual Dilophosaurus was a lot larger than that and there is no evidence that it was venomous. This was pure artistic licence. The film portrayed bird-like dinosaurs descending from reptiles, why not have a less well-known early dinosaur decked out with a silly neck frill based on a living reptile? During filming of the Lost World, new evidence came to light that a household favourite – Stegosaurus – had throat armour. The Jurassic Park post-production team edited their model of the Stegosaurus to reflect that research! This was how committed the franchise was to realism and accuracy. Yes ultimately they are making a monster movie and there are times when you have to suspend your disbelief and say ok, these velociraptors are bigger than in real life (fox-sized) but maybe they’re just misidentified Utahraptors (a little bigger than the film villains). Jurassic World director’s message to the real world. It sent a pretty clear message: rather than take what we don’t know about dinosaurs and embellish, as with the Dilophosaurus, this film was heading towards taking what we do know and throwing it away. Feathers have been a recognised feature of many theropod dinosaur specimens now and Velociraptor sits right in the middle of the family tree that has yielded the most feathery specimens. 1. “We must maintain canon” It’s a fair point. The Jurassic Park storyline is based on a world in which velociraptors have already been brought back to life and those velociraptors were bald. To add feathers now would be like replacing Daario Naharis’ face in Game of Thrones with a different actor’s and carrying on as if nothing happened… Oh, wait. The Jurassic Park franchise started to give a hat-tip to the feather issue in the third film when they added quills to the heads of their velociraptors. From what I can tell there was minimum fuss made about the inconsistency. If you take a look at the velociraptor page on the official Jurassic World website, you will notice that those quills have suddenly disappeared too. The inconsistency is already well established, why not keep it accurate? There is also reason to believe that the Stegosaurus models have taken a step backwards in quality too from the ones featured in, IMO, the best scene in Lost World. Will wait for the film to actually confirm this but, if true, it’s another break in the JP canon to the detriment of accuracy. Let’s forget for the moment that Velociraptor itself has recognised quill knobs where primary feathers attached to the fore arm and pretend we’re calling the over-sized movie velociraptor a Utahraptor. Some argue that these animals may have been bald while smaller theropods such as the real Velociraptor were feathered. The idea being that mammals are generally fluffy when small and bald when large (e.g. Elephants). There’s a problem with that: real species that were larger than the movie Velociraptors have also been found with a fluffy covering – an example being China’s fluffy Yutyrannus. Furthermore, the closest living analogy in size, behaviour and aggression to a movie velociraptor – the Cassowary – is fully feathered, so being that big does not present a temperature retention problem for that size of animal. Nor should we assume that a larger animal like Tyrannosaurus was bald either: due to their complex structure, feathers do not have the same overheating issues as hair. Africa’s ostrich is a good example. A mammal that wildly fluffy would have serious overheating problems in those equatorial climates but feather vanes have a blood supply, so they can be used to shed heat in ways that fur cannot. Finally, you would need to ignore the Jurassic Park compsognathus to make that explanation hold water. 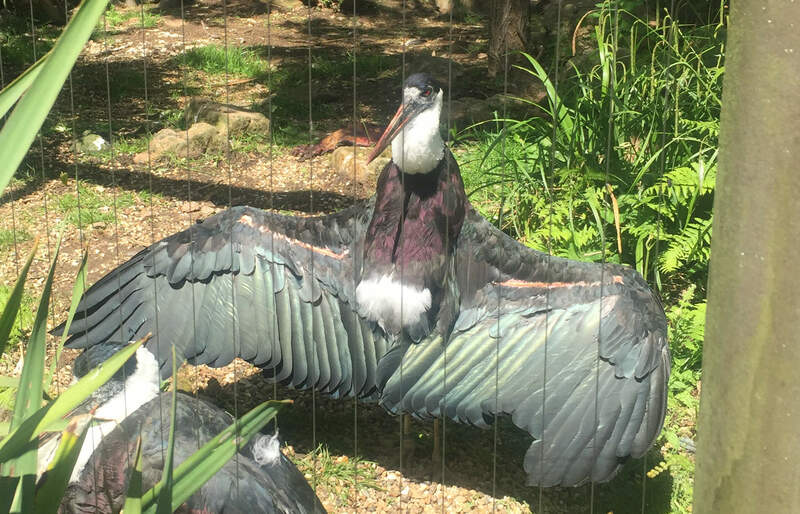 A woolly-necked stork letting it all hang out. Some birds do look a tad daft, I’ll give you that. silly and scary are not mutually exclusive though: The Eurasian eagle owl is a fluffy pair of binoculars that can tear out the hearts of foxes with ease – that’s absurd and scary! The movie dilophosaurus: very silly-looking but still more than a match for Dennis Nedry. I would much rather the disrespectful kid in the opening scene of the first film had something substantial to mock and be afraid of than just have it thrown out there as a plot device with no convincingly bird-like velociraptor to back it up. 4. “The managers of the park don’t care about realism” This actually is the most believable way to excuse the whole thing. If the technology existed to clone a dinosaur and that technology had made its way through the many ethical controls placed on genetic research, you’d better believe that the same people who run today’s theme parks would be all over it. 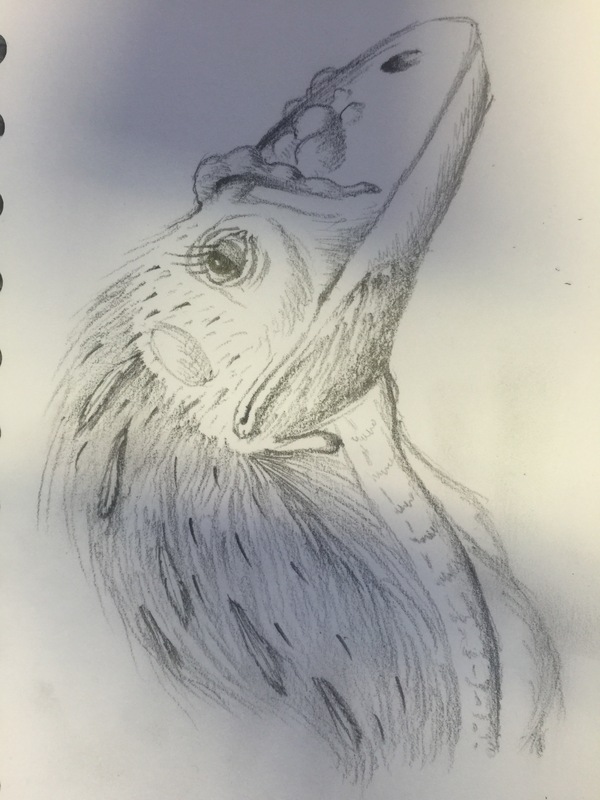 People like the good folks at Universal Orlando and their… interesting rendition of Velociraptor (see image below). If the Universal Orlando guys know they’ll get visitors on minimal effort, so too will the guys who run Jurassic Park. It’s a shame that it takes more work to reverse engineer an animal without certain features it started out with but perhaps – like the guys who make the films – they believed that more people would relate to their plucked dinosaurs than to realistic ones and went out of their way to make them. Whichever explanation I use to try and suspend disbelief, eventually I come back to feeling that, somewhere along the way, the Jurassic Park franchise has let me as a fan down and their reasoning sounds for all the world like they did it because of their other fans. They can’t please everybody all of the time but surely it’s better to maintain the standard of striving for accuracy that they used to uphold, please half of the people and educate the other half than just please half of the people. They have said they are not a documentary – and they’re right – but they still reach a greater audience than most documentaries could ever hope to and with that comes a massive responsibility. How many millions of people only know words like “Dilophosaurus” and “Gallimimus” because they watched Jurassic Park? How many of those look no further than the park for information about those animals? If that information is wrong, they stay misinformed. 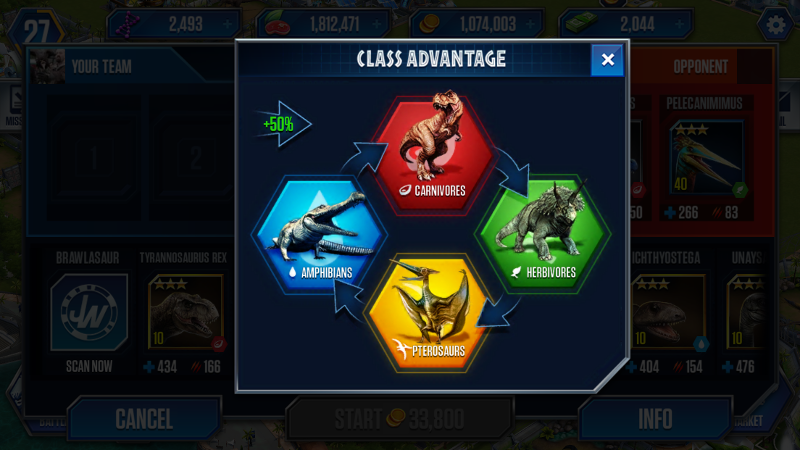 How many people will play the Jurassic World game on the App Store and come away thinking that crocodiles are amphibians and that “amphibian” and “pterosaur” are both types of dinosaur? Of course the science communication folks will use the film hype to engage with people about the real life stars of Jurassic World (except the completely fabricated Indominus rex who never existed) but it shouldn’t be necessary to the extent that it is. Can you imagine Physics communicators having to run behind the media hype of The Theory of Everything and explain that actually Stephen Hawking’s PhD wasn’t in Heliocentrism? It would be pointless to get that wrong just as it’s pointless to pluck our dinosaurs and clothe them how their distant ancestors may have looked. 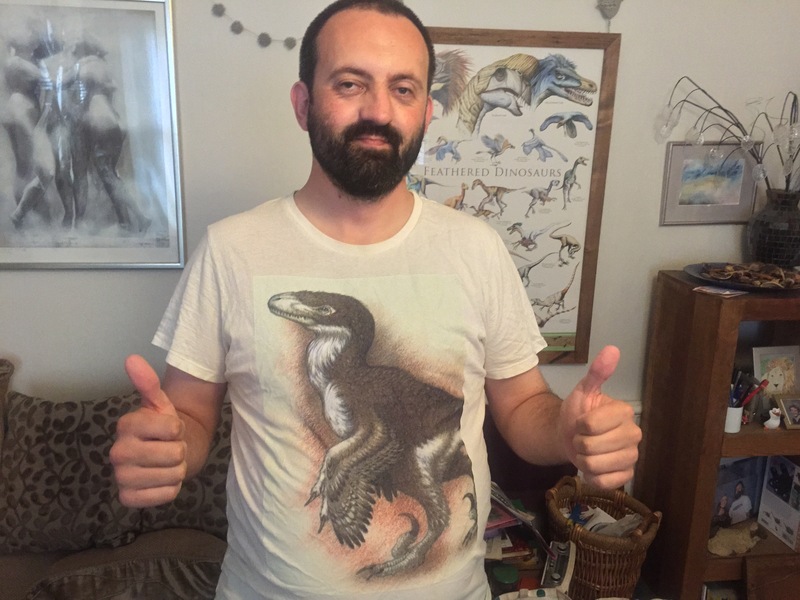 Jurassic World’s director responded to massive fan Gerald Lynch‘s unhappy blog, about the invention of a new dinosaur rather than utilising all the amazing real dinosaurs out there, and promised he would win him over. A small part of me hopes he will win me over too. I shall be watching the film of course but I am dreading it and excited in equal measure. It has been quite a while since my last post. The longer it got, the better that post had to be. Finally I found a suitable subject matter. 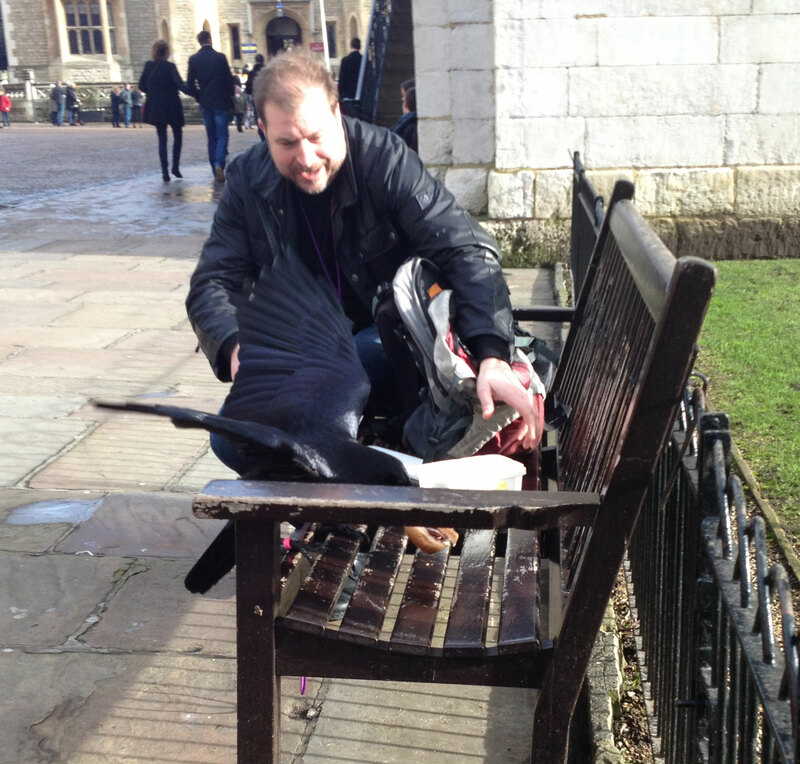 A friend of mine dragged me to the Tower of London the other Saturday. He wanted to soak up the story of Tudor England. I had a very different attraction in mind. 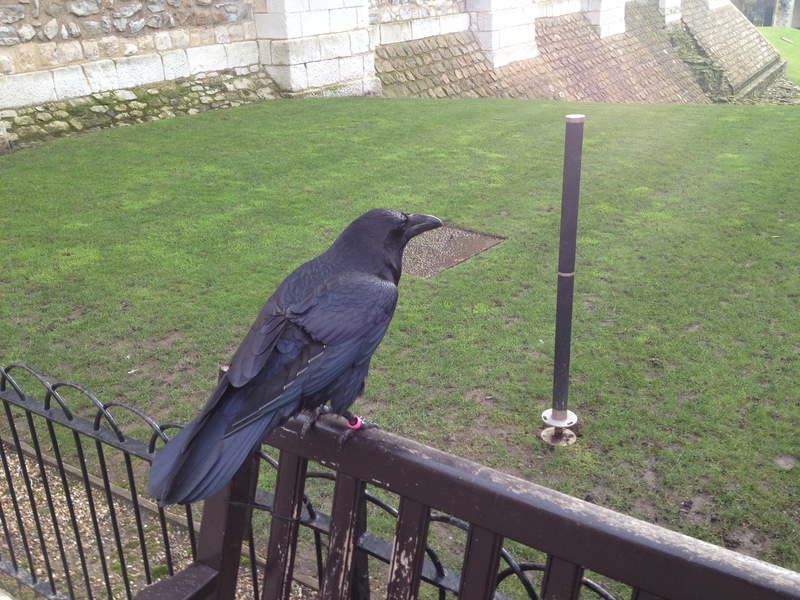 The Tower has been home to many fascinating characters – from Colonel Blood to the Crays – but none quite so intriguing to me as the ravens. These large Corvids are a great anecdote to 1980’s speculation of what large-brained dinosaurs might have looked like – if circumstances had permitted. The researchers came to the same conclusion that most alien speculators reach: regardless of origin, smart creatures must look like us because we are the archetypal intelligent species right? Wrong: circumstances did permit dinosaurs to diversify into extremely intelligent species; those species look nothing like humans; and chief among them is the raven. I cannot stress strongly enough how smart these birds are. 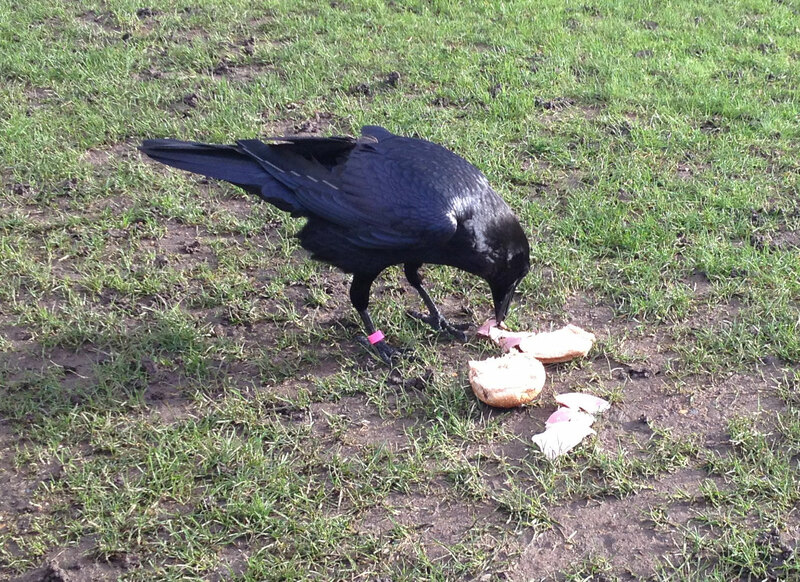 Their close cousin the Californian Crow has even solved puzzles not previously accomplished by chimpanzees. Ancient cave art shows that they have been our companions on the road to increased brain power for a very long time. It is likely that the ancestors of these birds regularly outwitted our own ancestors. 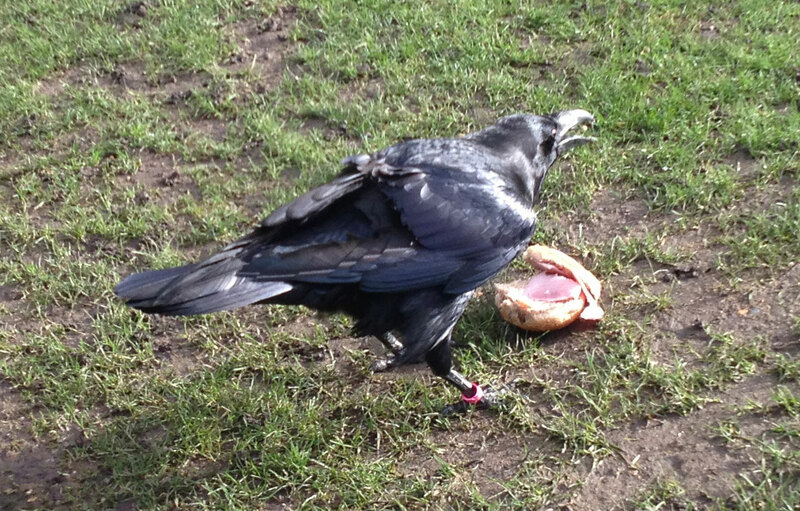 Merlina pretending she’s not up to anything. Moving surprisingly fast, her clipped wing is no disability. It all happened so quickly, this man was taken completely by surprise. 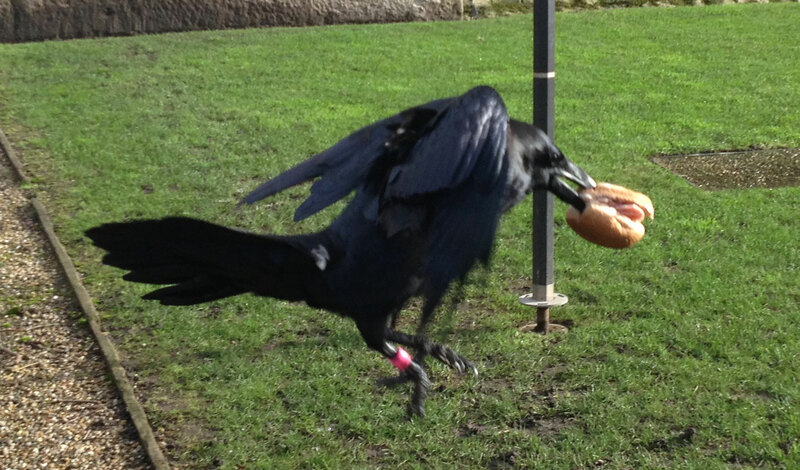 and off she flies with the boy’s ham roll! What’s a good heist without a celebration? She enjoyed her meal immensely. Are you going to steal my hard-won meal? I don’t think so. 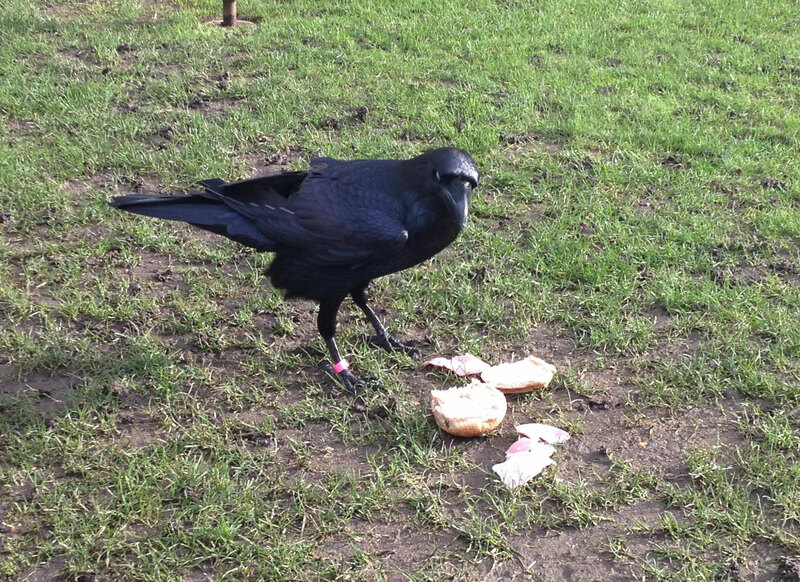 I spoke to one of the guides about Merlina afterwards. Apparently she does this quite often. She also clocks what food people throw away and turfs out the contents of the bin to retrieve it – much to the cleaners’ dismay. When being put away at night she must be put away last, or she attacks her mate. Like I said: a real character! 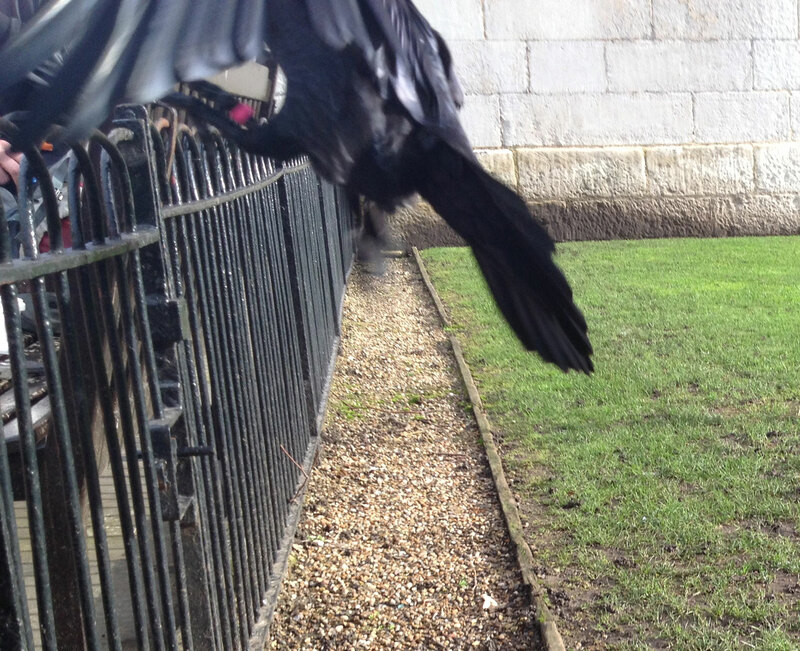 She is by no means the only character among the Unkindness or Ravens at the Tower. One of them plays dead in order to hunt pigeons and another pecks holes in the guide hut until it leaks (Merlina may be partial accomplice to this one). If you love your neighbourhood crow, jay, and magpie you could do far worse than visit their large cousins. Tell them I sent you, they probably understand. Richard Feynman is rapidly becoming the Oscar Wilde of Science, in that he is the name one should give in a pub quiz when unsure who to attribute something to. One thing we perhaps shouldn’t credit him with is the birth of nanotechnology. It’s a well known story: Dec 29 1959, Caltech. Feynman gives a talk, entitled Plenty of Room at the Bottom, in which he predicts that we will one day put whole libraries on the head of a pin. One thing leads to another until, in 1989, the word “IBM” is spelled using 35 xenon atoms. For Sai Maddala, a PhD student at Queen Mary, the story begins some 4.5k years earlier with the manufacture of the pigment Egyptian Blue. A distinctive and popular dye, Egyptian Blue has been found as far afield as Pompeii. One of the reasons for its success has been its durability (not its “beautiful plumage” as one might have guessed). The Egyptians knew that, when it is exposed to the elements, pigment rapidly fades. Not so the Egyptian Blue: by a process of heating copper lime & sand in a furnace Egyptian Blue cools to form sheets 0.87 nanometres (nm) thick, which are extremely resistant to everything except boiling water. Since the definition of a nanomaterial is that one of its dimensions must be under 100 nm (4000 x thinner than your fingernail), this pigment is a good contender for the earliest use of nanomaterials. Next we move on to a Graeco-Roman method for dying hair black: the technique uses lead oxide, slaked lime, and water to bind 5 nm thick lead particles around keratin proteins in the hair. Despite the worrying mention of lead in cosmetic treatments the technique did not appear to have any ill side effects. In the 4th Century ad, glassblowers started producing cups that shine one colour when the light comes from one direction and a totally different colour when the light direction changes. Nature has been doing this for millions of years of course (the structural colouration in hummingbirds for example) and is achieved by microstructures in the surface of the material. The Lycurgus Cup at the British Museum is an exquisite example of this. The effect in this particular case is created by gold and silver particles, 70 nm in size, at a ratio of 3 gold to every 7 silver. It is suggested that the process was discovered by accident when glass blowers threw coins into the furnace for luck. Later glass manufacturers would take this a step further by using gold particle research generated by alchemists and apply it to glass pigmentation. They found that, by varying the size and shapes of gold and silver nanoparticles, they could make an array of vivid colours of glass. An example of this later method can be seen in the large round window at Notre Dame, Paris. When our ancestors gleefully trotted off to “liberate the holy land” they encountered some remarkable technology: Damascus swords with a rather distinctive ripple pattern on their steel blades. 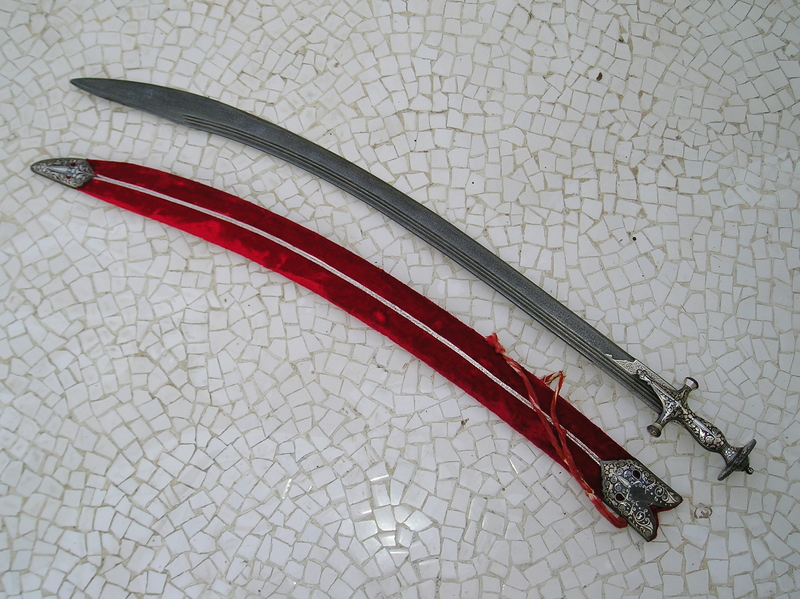 These swords were allegedly so sharp you could cleave a piece of silk fabric dropped onto their upturned blades. They also boast being able to cut rocks without blunting. If you’ve ever tried to cut a slice of bread with a steel fish knife you’ll know what an extraordinary claim this is. Recent analysis of these Damascus Swords reveal the presence of carbon nanotubes surrounded by a 50 nm layer of cementite. By treating the finished blade with a powerful acid (hence the wave patterns on the surface) the carbon nanotubes are drawn up to the surface, providing the legendary qualities described. Wootz steel manufactured this way has its origins in India at least as far back as 300 bc, though some argue it’s even older. Could this be the earliest non-aesthetic application of nanotechnology? I am not doing justice to Sai’s talk: he mentioned much more than this including the 7th Century process of trapping pigment in clay at the Yuccatan peninsula, as well as a run-down of the key figures, discoveries and inventions which contributed to our modern understanding of nanotechnology, such as: Faraday’s experiments in the 20’s with gold nanoparticles; Richard Zsigmondy and the ultramicroscope; Jean-Baptiste Perrin and Avogadro’s Constant; Sir Humphry Davy; Döbereiner’s lamp & lighter; platinum sponge; Paul Sabatier and the hydrogenised nickel catalyst; G. Binning & H. Rohrer’s scanning tunneling microscope… I know I’m missing a few. Keep an eye out for this guy: the subject of his PhD has some amazing nanotechnological applications for modern medicine. Join us on the 9th September when PubSci will be turning its attention to Syphilis in Southwark. Much is made of the “subjective value of art”. Listen to some and you would be forgiven for thinking that there are no absolutes whatsoever in the value of art – that there is no point trying to score a piece of artwork by its virtues or shortcomings and any attempt to do so is a kind of neo fascism. In reality a piece of art does have many objective values but the weight those values have in the eye of the appreciator make the difference in how that artwork is subjectively enjoyed. What happens when that artwork had to destroy something in order to be created? This story is nothing new: the tyrenian purple dye used in ancient Rome cost 8,000 whelks for every gram, such was the production process. This made it very expensive, though I doubt many people lost sleep over the massacre of whelks. Anyone with a property that has been singled out by a graffiti artist will have to make a decision about whether the art on their beloved wall has raised the value of the wall or lowered it. This ultimately depends upon the history of the wall and the quality of the art. 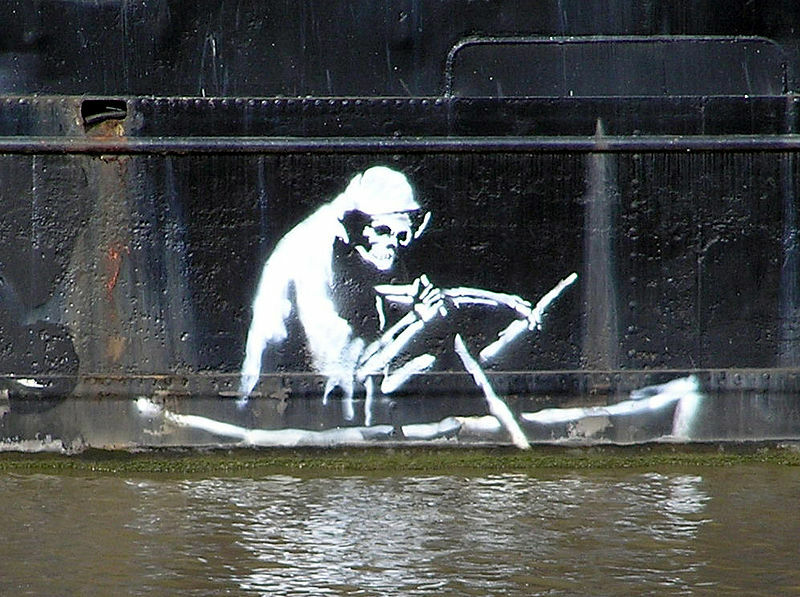 An example of Banksy graffiti. Sometimes it’s a clear-cut distinction: a Banksy on a rather machine-cut modern wall of no import or an offensive racial slur on the side of an ancient temple. It’s easy to say whether the addition has raised or lowered the overall value. Other times, the issue is much murkier. National Geographic ran a story a few months ago on the Russian mammoth ivory trade. According to the article, mammoth tusks still litter the Russian steppes many millennia after their extinction. Some people earn their livelihood searching for them and selling them. Ivory-obsessed cultures such as China buy the tusks and, in the specific case of China, spend up to five years carving the ivory into something else. 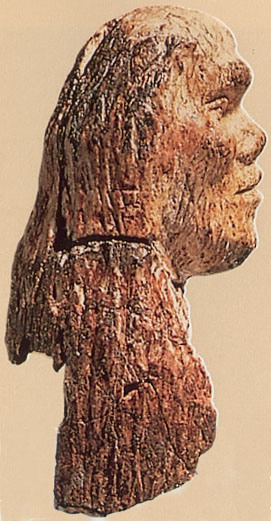 An example of the ivory carved artworks can be found here. There’s no denying that the resulting pieces are skilfully done but, personally, they don’t justify the deliberate destruction of something already beautiful and irreplaceable like mammoth ivory. 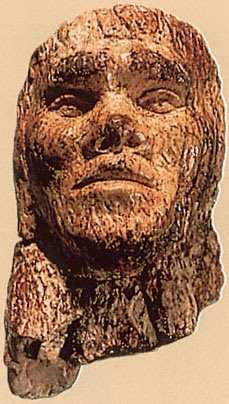 Just like the modern Chinese carvings, this was also carved from mammoth ivory but now it is a 26,000 year old likeness of Cro-Magnon man – made by a Cro-Magnon – giving us an eyewitness window into a prehistoric world. It is now so old that it has innate historic value of its own in addition to the craftsmanship required to fashion it. It didn’t destroy the mammoth tusk any less but somehow it feels more acceptable. 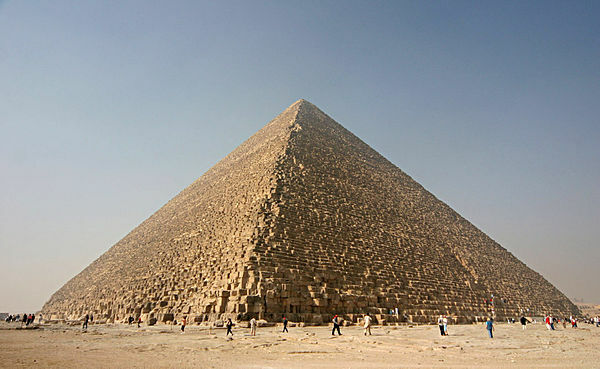 Here’s another paradox: the Egyptian pyramids. Last surviving wonders of the world, they are a breath-taking testament to human achievement. The blocks used to construct the pyramids were hewn from nearby limestone quarries… Limestone quarries in which we have subsequently found the remains of Basilosaurus, the grandfather of modern whales. Are there more fossils of Basilosaurus or its contemporaries locked inside those limestone blocks that make up the pyramid? I would be very surprised if there weren’t. Most people wouldn’t even consider taking the pyramids apart to find out. You had better hope I’m never in a position to make that decision because I would consider it. So where is the line for you? At what point does art cease to be worth the sacrifice made to create it? Here’s a fun little challenge for you this Thursday: see if you can count the foxes in this image. I’ll give you a hint: there’s more than one. I saw this family romping in the tall grass on my way back from the Co-op yesterday. They’re lucky for Urban foxes – they have large rural spaces to hide in and lots of real prey to hunt. I only hope they learn caution quickly: they were far too trusting of us. What would you do if you had a year to identify and evaluate the contents of your natural history collection? A quarter of a million specimens spread over two sites, that’s an average 2 minutes and 6 seconds per specimen. If you must insist on eating, sleeping, travelling from one site to the other… that time per item rapidly dwindles. 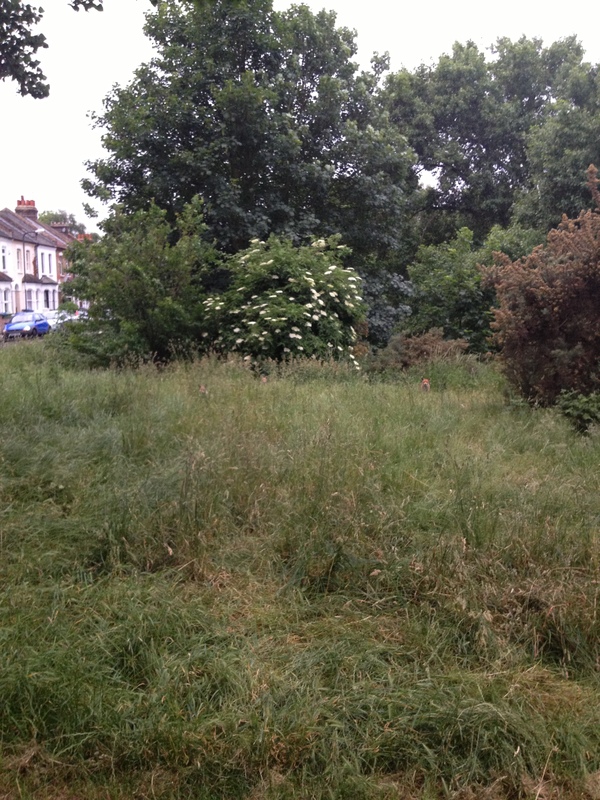 These are the issues facing the Horniman Museum’s Russell Dornan and the Bioblitz team. Despite his daunting schedule Russell still found time to come and talk to us for three hours. That gives the PubSci audience a collective value of 85.7 museum specimens. I’m very flattered by that! The issues that face the Bioblitz process are numerous: in the liquid stores you have a giant fan running in the background that prevents you thinking when it’s on and stops you breathing when it’s off; Elsewhere, the drawers and storage units are packed together so tightly that you cannot reach some specimens for the layer of other specimens in front of them. The Horniman staff are a knowledgeable bunch but the total breadth of knowledge required to identify the value of the whole collection requires outside wisdom. Independent adjudication is a very good idea, I wish more people did it in other industries. Coordinating visits from outside experts so that you make the most of their limited time is another challenge in itself, especially when multiple collections share the same storage space. Nevertheless their input is well worth the effort. Horniman curator Paolo Viscardi said he learned more about reptile identification in the day and a half of Colin McCarthy’s visit than he could have learned with months alone amongst the reptile bones. In some cases the value of the specimen can be quite ordinary but the way in which it was prepared gives it historical value. An example of this are the “double preps” – specimens with the outer skin layer on one side and the skeleton on the other. These are an 18th Century German preparation technique and there are 18 of them in the Horniman Museum, including Patches & Persephone the double prep dog & cat respectively. If you know of a larger collection of them than this, please let me know. The Horniman Hornbill on its T-shaped perch tells of its uniquely French preparation, while the lollipop birds are quite amusing. More on those in my future post on structural colouration. Sometimes fakes become more historically valuable than the genuine specimen too: the Precious Wenteltrap, for example, is a tightly spiralled mollusc whose shell is almost paper thin. In life it is kept in shape by its soft organs but, once dead, becomes increasingly fragile. Fakes made of rice paper were rife until identification and preservation techniques of the real thing improved. Now, due to their highly edible nature, the fakes are very rare & worth more than a real Precious Wenteltrap. All in all a great talk and I look forward to seeing more from the star specimens in the future as they are digitised and uploaded. 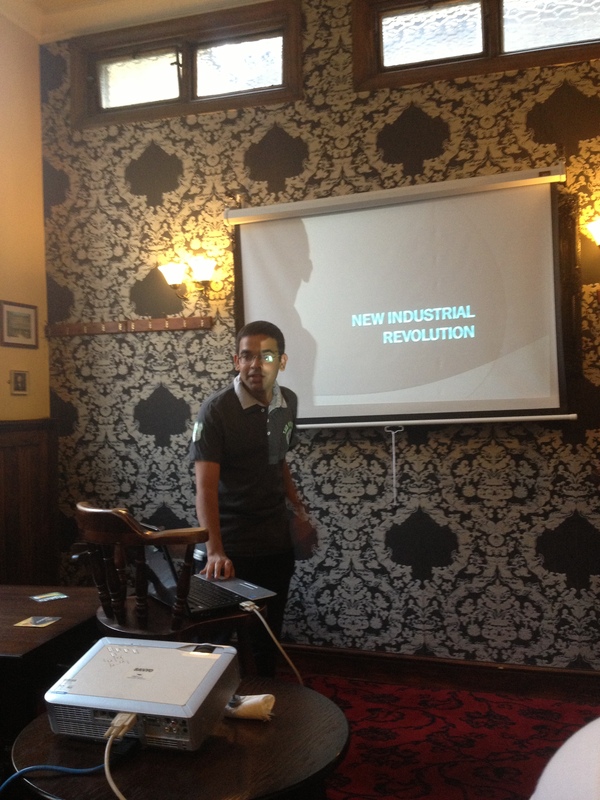 I hope to see lots of you at next month’s PubSci. Until then, have a great month. High on the top of a church roof in Sheffield there lives a small family of wild theropod dinosaurs. The species in question is Falco peregrinus – more commonly known as the Peregrine falcon. Thanks to the University of Sheffield, this beautiful predatory bird’s nesting behaviour is freely accessible live on cam. I have them on in the background, they’re more entertaining than any virtual “desktop companion”. Yesterday’s feeding was particularly eventful. Below is a gallery of 51 images taken from 14:46 to 16:36. There are 3 chicks and an egg in the nest. I have only recently started following their behaviour so I don’t know if this is a chick that never was or a sumptuous morsel brought in by a parent. Today’s windy weather revealed the shell has been pecked open on one side and is now completely hollow so either way it became food. The chicks alternate between playing with it and pretending to incubate it. It’s very clear from watching them that there is a range of personalities there even though they are quite hard to differentiate by appearance. One of them is very bold and pushy – frequently pinching food off the others and hiding it under its mantle. Today this one has done a lot of wing-spreading in the wind and I suspect it will be the first to fly. Another chick seems quite cautious and lets the others push in front for food. When it finally did pluck up the courage to take some, it got a small feather stuck in its throat and spent the remainder of the first course learning how to dislodge it (frames #24 – 26). The parent did not attempt to help remove it but just flew off to collect the next course. This gallery is no substitute for watching the live feed but this is stuff they won’t repeat again and no two meals are alike so, if you missed it, this is as good as it’s getting. They’re a delight to watch and they are constantly surprising. I’m so glad Sheffield Uni have done this and so glad the peregrine falcon is making a small come-back in that area. Classic art training recommends making a grid of progressively darker shaded squares to act as a guide beside our work – an absolute shade reference to compare against the relative shade of the surrounding parts of the picture, which can trick our eye and lead us astray. Adding just a couple of extra shade ranges can make the difference between a dull, flat-looking image and a rich, photorealistic one. In days gone by a person could spend a year or two just studying greyscale images to get used to the importance of shading before moving onto colour. To help demonstrate this concept let’s use a photograph of a living Theropod. 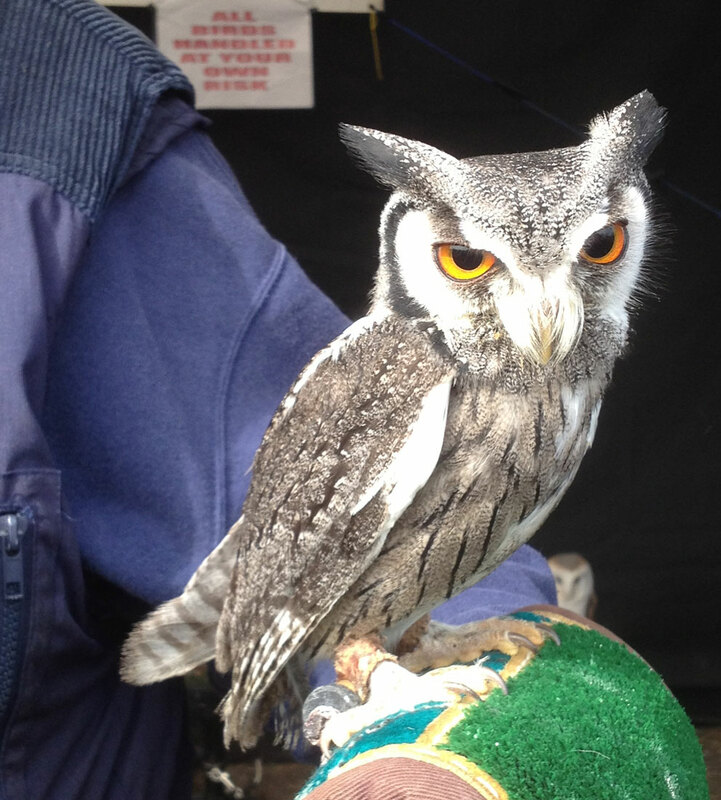 Here we have a White-faced Scops Owl and we’re going to break down the photo into sections based on each pixel’s value. Before taking a peek at the end result, take some time to look at the photograph: see if you can predict where the mid ranges are; where the highlights are; where the shadows are. Chances are you’ve divided the image into 3 in your head and this is what translates onto the canvas without practice. Now let’s take a look at the pieces of the image. I made a utility in C# to getnerate these for any given photograph. I’ve placed a swatch of the shades beside each generated value with a highlight to indicate which shade range we’re looking at. I had to offset the backgrounds by 128 shades to make it easier to view but I can provide transparent versions of these for anyone who’s interested – it’s quite fun pasting each image into a new layer in Photoshop Elements and watching the image build back up. I thought about making an animated GIF of it but the colour palette distortion would have been deceptive. Controversy, thy name is PubSci. This evening we heard a talk by Professor Martin Chaplin on the remarkable properties of water. 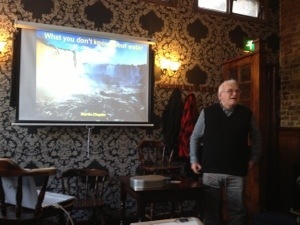 The talk started with some very unusual observations: firstly that liquid water contracts when heated, while most things expand; secondly that water molecules may move apart as the water density increases. It sounds counter-intuitive but there are good reasons for it. Dr. Chaplin discussed the predictable instability of water: how the H2O bonds constantly break apart and form ion pairs, which last for mere milliseconds but 1 in every 60 water molecules exist as an ion pair at any one time. This allows water to form (H2O)5 molecular clusters, which break and re-form easily. Dr. Chaplin showed that water behaves counter-intuitively in other ways too. At -100 degrees Celsius you get glassy structures, change the temperature or the pressure and crystals form. Water also behaves like two different substances depending on the pressure: at high pressure it behaves like other liquids; at low pressure it does not. When electrically charged, water can defy gravity – creating a bridge between two bodies of water that flows one direction on the outside and the opposite direction on the inside. This is so odd it deserves its own paragraph and I can’t believe I almost forgot to add it. Just like the subject of his talk, the talk itself got stranger as time went on. We covered nano bubbles (100 nm cavities in the water) and the Young-Laplace equation, why Nature Journal is convinced they don’t exist (Nature 2007, 445, 129) and how they can be measured and differentiated from dust particles using resonant mass measurement, dynamic light scattering, laser scattering, electrical resistance, and Brownian motion. Whilst I applaud any scientist who does not commit the Appeal to Authority fallacy and accept the findings of an established journal just because they said so, I did get the very strong feeling that a large part of his argument was an appeal to our fondness for the underdog up against the establishment – or what I call Dr. Jack Horner syndrome. My suspicions were borne out as the subject turned to “water having memory”. The basis given for this statement was that when you stir one of two identical glasses of water, you can tell which one was stirred by examining the chemical composition of it. Glass dissolves so the stirred glass will have minutely higher traces of silica in it than the unstirred glass. If you stirred it long enough you would have hydrogen peroxide. At this point an audience member asked whether she could produce enough hydrogen peroxide to dye her hair – to which Dr. Chaplin replied that her hair would be white by the time she finished. Another audience member brought up the point that all matter in the universe has “memory” by this definition and that his insistence in the case of water was some sort of fetish on his part. What intrigued me about Dr. Chaplin’s presentation style was that he defended elements of the validity of homeopathy without believing in homeopathy itself. I would very much like to see a presentation made by him in front of a pro-homeopathy crowd to see how different it is. I think Chaplin really enjoys goading people and that comes across strongly in his performance. He raised some interesting questions at the end: whether the binary state of H2O / ion pair could be responsible for the memory of living organisms in the same way that binary switches work in computing; and whether the states of water could be integral to our understanding of cancer – in cancer cells the water tends to be more fluid. A fascinating and engaging talk, even though I felt I was being coerced into agreeing with him at times (projection slide labelled “closed mind or water has memory”), which is always a turn-off. Come along next month – we’re either talking about: debunked alien babies; 1960’s spaceballs; or swimming robots depending on the timetable of the speakers. Whatever the topic, science + beer = good.